For many people, the new year offers an opportunity to reflect on the status quo and search for ways to improve, especially in the area of personal fitness. “My advice to anyone come the new year who is trying to start a healthy routine would be to, at first, try to get moving every day in some way,” says Tonya Taft, a longtime fitness instructor and personal trainer at the Salvation Army Kroc Center. Fortunately, the region is rife with ways to add a workout routine into your daily habit, both indoors and out. “Even when the weather is a little chilly, I quite enjoy bundling up and going for a hike or snowshoe,” says Taft, who also likes cross-country skiing during the winter. Rent the necessary equipment at VERTICAL EARTH at 1323 E. Sherman and find places to do all three activities using IDAHO PARKS AND RECREATION’S detailed website (parksandrecreation.idaho.gov). “It’s always a good idea to have a friend to work out with to hold you accountable,” says Taft. 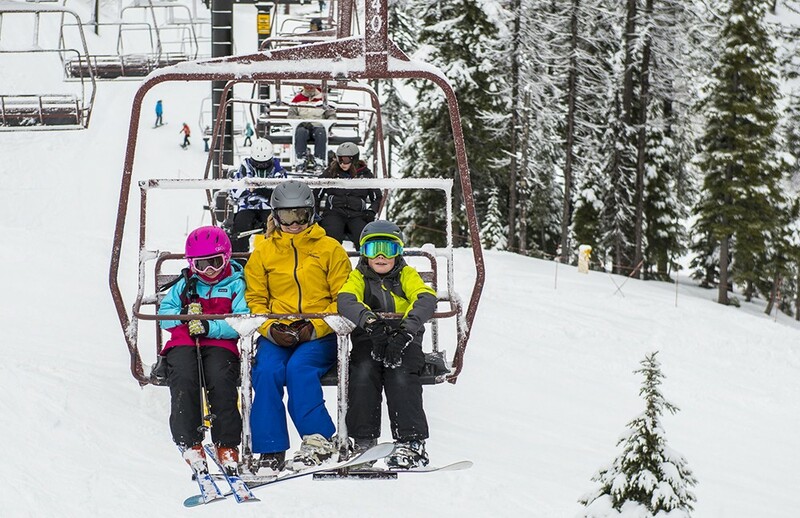 Get the whole family involved or get together with friends at SILVER MOUNTAIN RESORT in Kellogg or SCHWEITZER MOUNTAIN in Sandpoint for fitness with a healthy dose of fun. If you’re ready to find new ways to have fun on skis, sign up for NACHTSPEKTAKEL on Jan. 4 at Silver Mountain. Translated from German, nachtspektakel means “night spectacular.” It’s a traditional European ski event that builds bonds through the sport of ski touring. Event tickets are only $25 and include the night tour, drinks and snacks at the Kellogg Peak Fire Lookout. 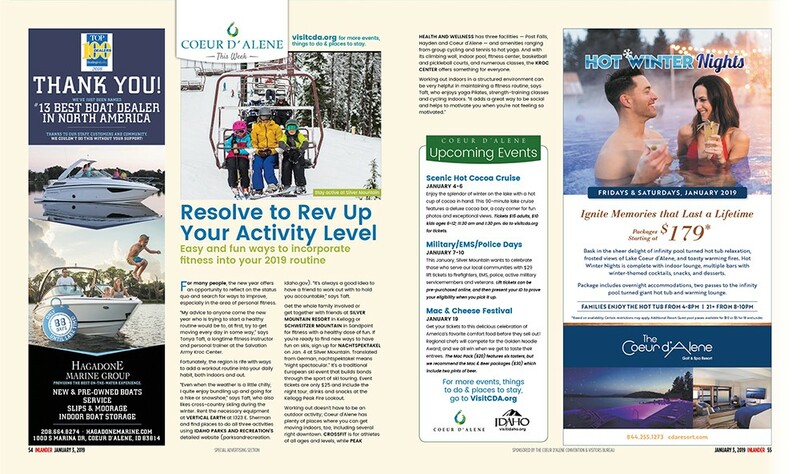 Working out doesn’t have to be an outdoor activity; Coeur d’Alene has plenty of places where you can get moving indoors, too, including several right downtown. CROSSFIT is for athletes of all ages and levels, while PEAK HEALTH AND WELLNESS has three facilities — Post Falls, Hayden and Coeur d’Alene — and amenities ranging from group cycling and tennis to hot yoga. And with its climbing wall, indoor pool, fitness center, basketball and pickleball courts, and numerous classes, the KROC CENTER offers something for everyone. Enjoy the splendor of winter on the lake with a hot cup of cocoa in hand. This 90-minute lake cruise features a deluxe cocoa bar, a cozy corner for fun photos and exceptional views. Tickets $15 adults, $10 kids ages 6-12; 11:30 am and 1:30 pm. Go to visitcda.org for tickets. This January, Silver Mountain wants to celebrate those who serve our local communities with $29 lift tickets to firefighters, EMS, police, active military servicemembers and veterans. Lift tickets can be pre-purchased online, and then present your ID to prove your eligibility when you pick it up. Get your tickets to this delicious celebration of America’s favorite comfort food before they sell out! Regional chefs will compete for the Golden Noodle Award, and we all win when we get to taste their entrees. The Mac Pack ($20) features six tasters, but we recommend the Mac & Beer packages ($30) which include two pints of beer.